It was a bright sunny spring day in1967 as I sprawled out in the sunporch and leafed through the Sunday New York Times travel section.Summer was approaching and we were beginning to think of where we’d go camping this year.It was a ”third” year and thus one to selfishly devote to our own little family all by ourselves. “First” and “Second” years were respectively allotted to visits with paternal grand parents and family relatives in Utah, and visits with maternal grand parents and family relatives in Vermont. We always looked ahead joyfully to the “third” year when we alone determined where to go and what to do. 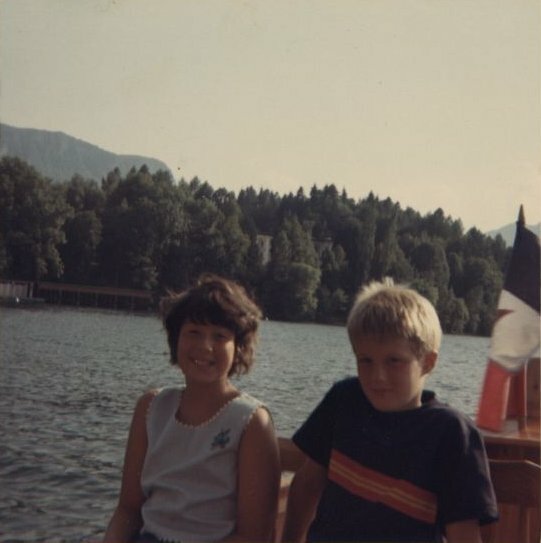 We loved the outdoors for hiking, fishing, and nature watching and were devoted campers – and, we loved to travel and were looking ahead someday to taking the kids off on a trip to Europe. 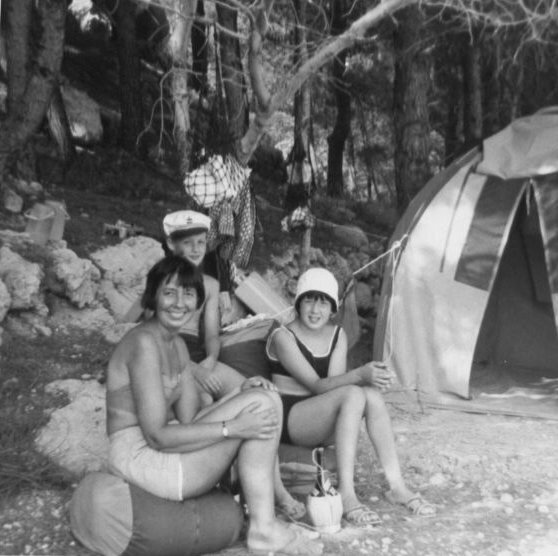 And there before me in the New York Times was a long article about camping vacations in the Plitvice lake region in the mountains and on Dalmatian coast beaches of Yugoslavia! I immediately thought this might provide a way in which we could have our cake and eat it too! I drooled over the photographs of the inviting camp sites and beautiful lakes and beaches and called to Barbara, my wife, to come and see them. 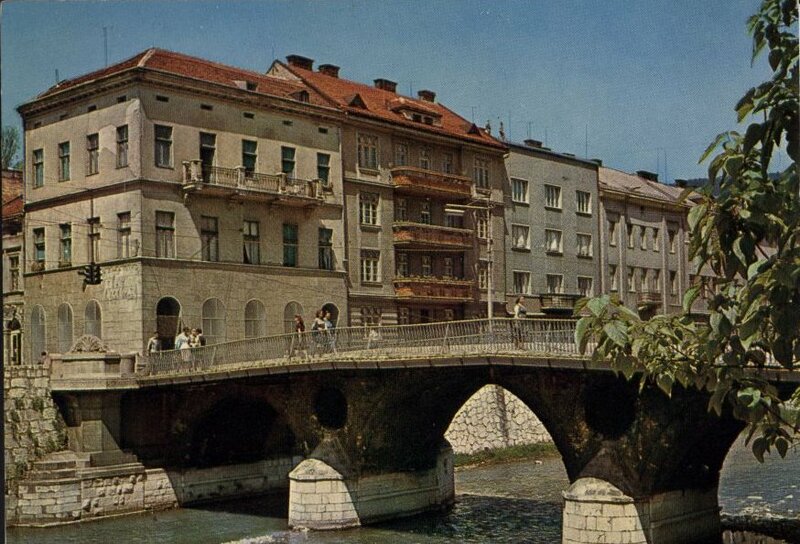 We were immediately of a single mind in thinking that we could have our trip to Europe and our camping vacation at the same time if we were to go to Yugoslavia. 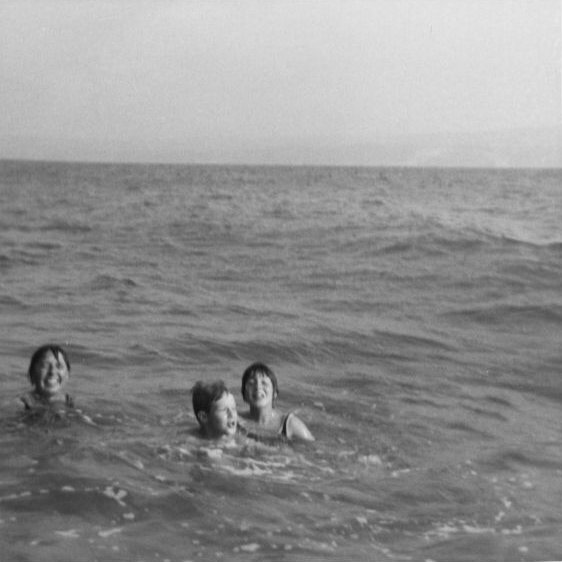 The planning for our trip started at that very moment – and didn’t stop until we were in Yugoslavia in the summer of 1967! Barbara was the only one of us who had travelled to Europe. 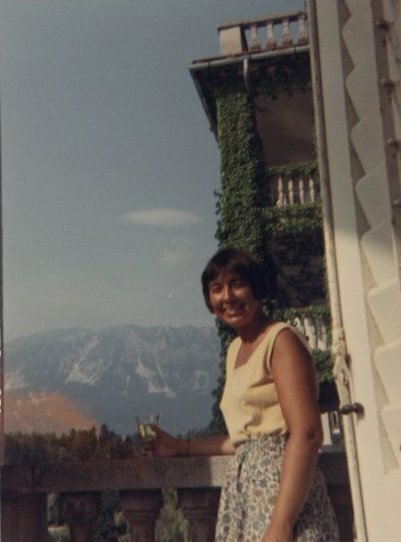 She had spent the summer in1947,in the French Alps with the “Experiment in International Living” helping to care for a group of orphaned French children. That experience left her with a longing for another trip to Europe. 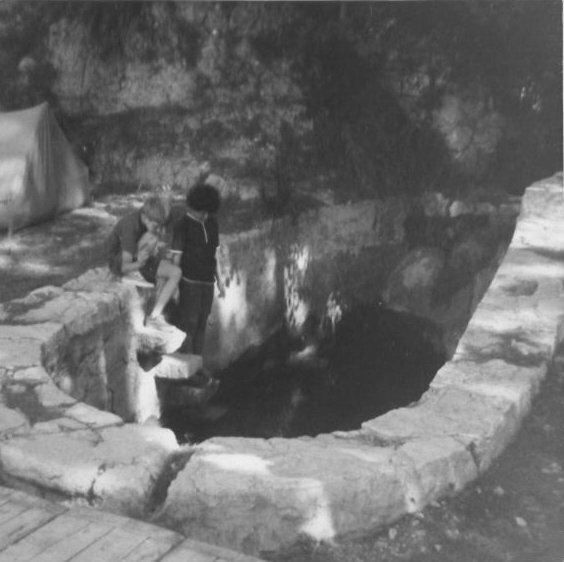 Pam and Jon, ages 10 and 8, were too young to make serious objections to such a trip – and were quite impressed with the pictures in the article, and I could almost see the trout swimming in those lakes and smell the camp fires. As our planning progressed,however, some of our friends seriously questioned the wisdom of such a trip. They pointed out that Yugoslavia was still a dangerous Communist county, and that camping by ourselves behind the Iron Curtain would surely be dangerous. Many of them thought we must be crazy to even think of such a trip. Some were sure they had read news articles about bandits attacking and robbing people in the mountains of Yugoslavia. I was also somewhat discouraged from proceeding with our plans by the University security officer. I was on the faculty of Temple University and involved in a research project on the effects of simulated space travel on human physiology, for which I had received relatively high security clearance from the Federal Government. 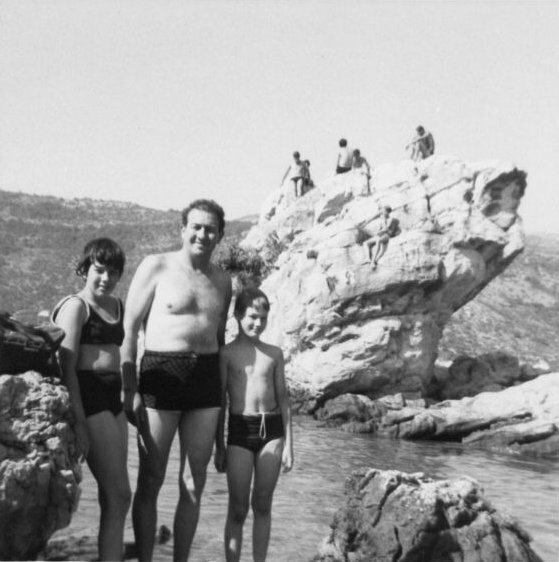 The University security officer told me that I would have to be debriefed by him before going to a Communist country, a process which stressed how one might be under very close surveillance in the Communist country – not a very pleasant prospect during a family vacation. 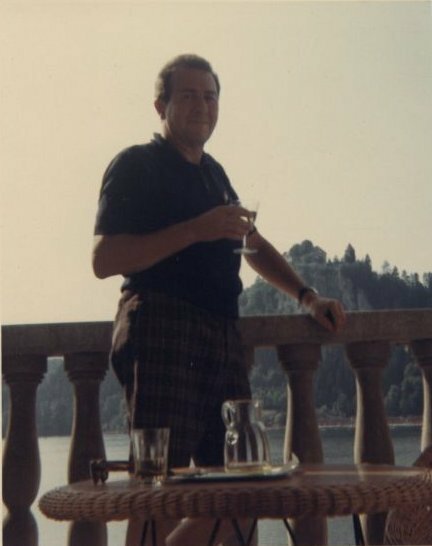 But a scientific colleague assured me I would probably not be bothered in Yugoslavia, but would probably be peppered with questions by the C.I.A. when I returned home. He was right! Anyway,we proceeded with our plans to go to Yugoslavia and engaged a travel agent to help us make the arrangements for air travel,car rental and hotel reservations in Belgrade through Kompas,one of the two official Travel Agencies in Yugoslavia.Our travel agent got us tickets on Pan Am flightnumbers1 and 2 (round trip between New York and Belgrade), reservations in the Majestic Hotel in Belgrade for the first two nights after our arrival and the night before our departure for home, and a small-car rental (we hoped for a Volkswagen Beetle with a luggage rack on top). We were planning to stay about 3 weeks, camping most days and arranging our own hotel reservations for the other days. 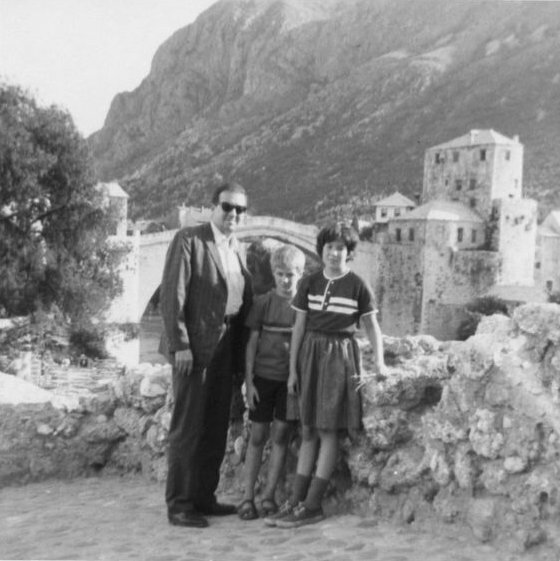 For our part we applied for and got a single family passport to cover all four of us and we then began to learn about Yugoslavia – the country, its people, its customs and its history. We carefully selected the camping equipment we would take and allotted ourselves one small overnight suitcase each for clothes and personal items. Our goal was to travel light and simple! At Goldberg’s Camping Goods Store I found a large canvas duffel bag into which we stuffed a compact 9 foot diameter Thermos Pop-up tent, 4 sleeping bags, 4 ponchos, a set of metal camping dishes, a small tool kit, a small telescoping fishing rod, dish towels, beach towels, some rope and a few rolls of toilet paper. When stuffed full, it weighed a little over 80 lbs., which I decided I could hoist around without too much difficulty. Finally we studied road maps of Yugoslavia as we decided where we wanted to go and what routes we should take. We decided to travel mainly in the Northern two thirds of the country. (I was somewhat fearful of getting too close to Albania and Bulgaria lest I should make a mistake and drive into them). 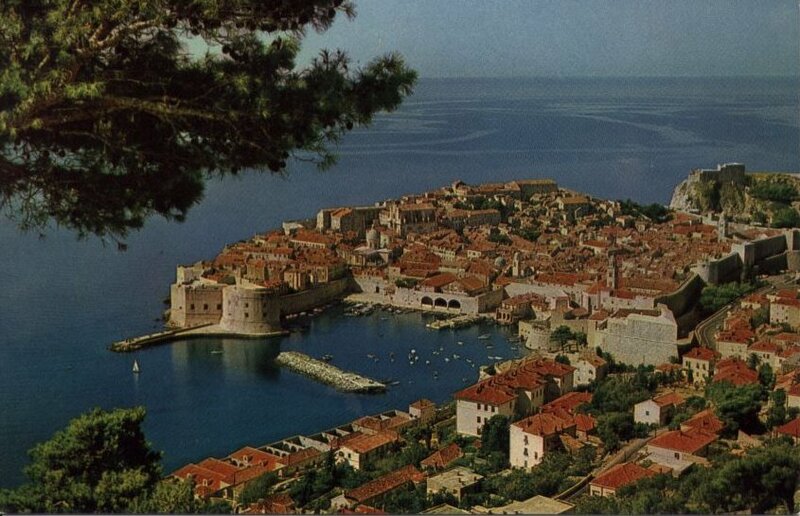 We would go no farther south than Dubrovnik, but as far north as we could. Finally, the day of departure arrived and we found ourselves on Pan Am headed for Belgrade with no clear idea of the remarkable adventure we were in for! I knew not a single word of Serbo-Croatian. Barbara had at least learned the Cyrillic alphabet and how to say please and thank you. I was naive enough to think that with English and Barbara’s French we could make ourselves understood. What a mistake that was! At the airport in Belgrade we collected together our huge dufflebag and overnight suitcases and then breezed through Passport Control and Customs with a simple wave of the Official’s hand. Outside there were quite a few taxis waiting for business. I selected a man standing by a big Chevrolet Impala with a big trunk and said, “Hotel Majestic please”. He smiled and nodded and opened the trunk and easily stowed or gear inside. He knew enough English to understand that we were there for a camping vacation in Yugoslavia, and I showed him our marked up map with the routes we were going to take. I asked about the roads I had marked; he looked at the map for a couple of moments, then nodded and said, “OK”. As it turned out, one of the roads I had marked was not really OK, but more on that later. He also handed me a map of Belgrade and Indicated that I should keep it. It was in German, but I figured I could handle that. But a little later, driving around in Belgrade, I soon realized I could not read the Street signs in Serbo-Croatian. 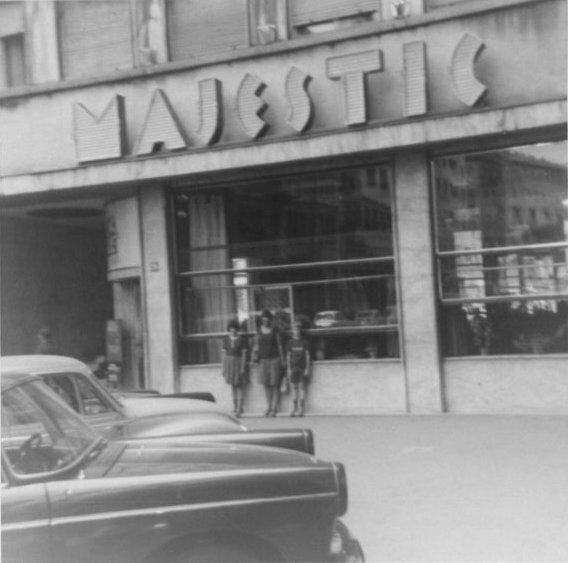 We checked into a pleasant set of rooms in the Majestic Hotel and waited for our car. Our travel agent had arranged to have the Tourist Agency, Kompas deliver the car rental to the hotel the afternoon of our arrival date. A man soon delivered it and collected some of my American Express travellers checks in advanced payment for it. It turned out to be a Fiat 124, with a Naples license plate and with a luggage rack on top. Fortunately, the Kompas agent spoke English,as did the hotel Concierge. I learned from them that we did not get the Volkswagen as requested because the Yugoslavs did not want to do business with Germans if they could avoid it. Besides they assured me that the Fiat 124 had just been selected as the European car of the year, and was much better than a VW. So I signed the travellers checks and asked the man to show me the car. He had it double parked outside in the midst of what looked like a traffic jam. He shook my hand and started to say goodbye, but I quickly insisted that he get in and let me drive the car, with him in it, back to the Kompas office so I’d know I could operate it OK . He was not too pleased at my suggestion, but got in the car nevertheless and directed me to the Kompas office through some very congested streets. After that short experience I felt I could probably drive the car almost anywhere – if Barbara could only translate the street signs well enough to show me where we were on the map. After getting the car,and finally finding a place on the street to park it,we still had time for two interesting experiences before dinner at the hotel.The first was a visit to an outdoor cafe for something cold to drink.When a pretty young waitress came to our table,it was easy to order for Barbara and me,because we wanted wine and the language for that was pretty universal,Vino-Rubro or Bianco,the correct words for red and white were learned only later.But,I wondered what we might order for the kids.While I was wondering about it,Pam said “A Pepsi for ME please”, and as our waitress wrote on her pad, Jon said “ Pepsi for me too”. And we all got what we asked for. 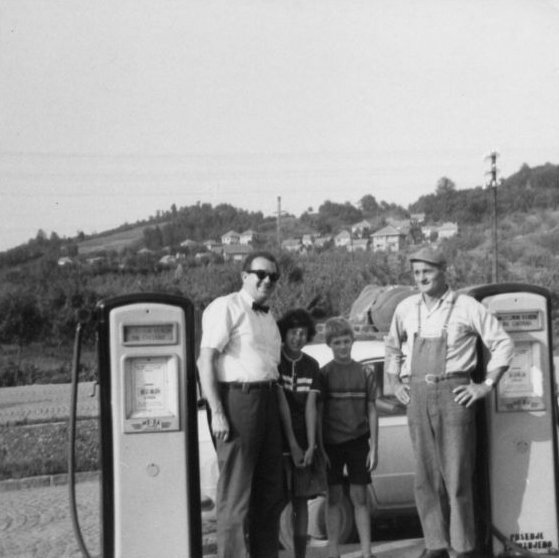 Having a Chevrolet for a taxi and Pepsi’s to drink, I began to suspect that Yugoslavs were at least partially Americanized, and they certainly seemed to accept us in a friendly manner. Our second memorable experience on that first day was a visit to the old Turkish Fortress on a hill overlooking the junction of the Danube and Sava rivers. This was a very interesting place to see especially after having read about how cruel the Turks had been as conquerors some 500 years ago. 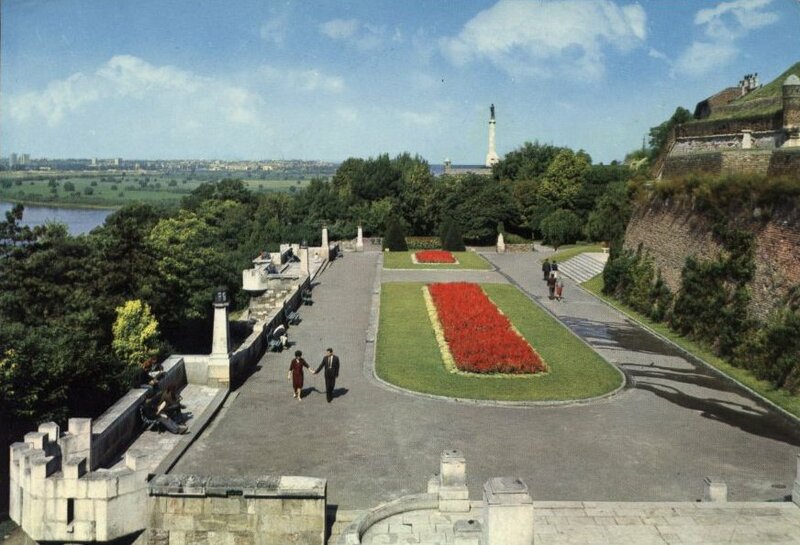 But, the view was magnificent and the surrounding park very pleasant to stroll around in. 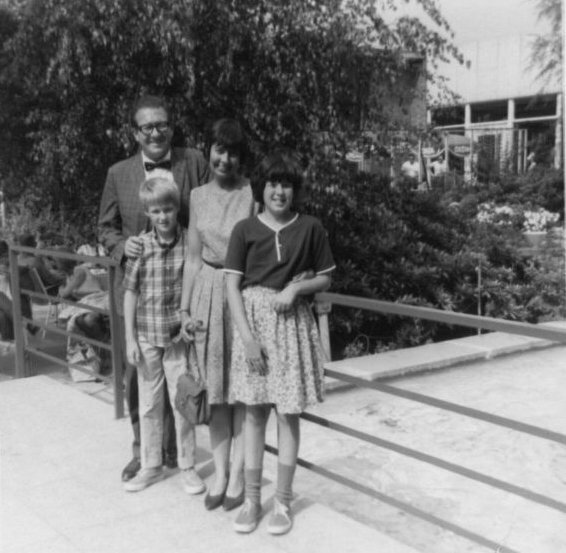 The kids and I walked along one path toward an ice cream stand while Barbara went off to find some postcards. The word for ice cream, sladoled, was one of the first we learned and it was delicious. I decided to visit a lavatory we had passed by on our walk, so Jon and I headed for the men’s entrance indicated by a man’s shoe on the door, (as opposed to a high heeled women’s shoe on the door at the opposite end of the building). Jon and I positioned ourselves at two urinals at the far end of the room next to a closed door and about a half dozen sailors in uniform lined up between us and the entrance. We were in the midst of our chore when the door next to where I was standing suddenly opened and a young teenage type girl walked behind us and cheerfully said, ”dobardan”, which we later learned meant “good day”, and then proceeded to clean the row of stalls behind us. Jon’s eyes sort of rolled up to meet my gaze, but when I kept right on with our task, he did the same until we were finished. The sailors on the other hand made a terrible clamour with exclamations we could not understand and stumbled over each other as they rushed to get out. After Jon and I left the lavatory, Pam decided she should go, so she entered the door on the other end of the building. Then Barbara joined us soon after, and she too decided to go in just as Pam was coming out. After a short time Barbara came out and joined us , but we noticed she looked rather puzzled and asked why. She turned to Pam and asked, “what did you think of the ladies toilet?” Pam smiled and said they were different, but that she had noticed the footprints showing you where to place your feet and the hand railings for holding on. It was,of course, our first contact with Turkish style toilets! Our second day in Belgrade also brought a couple of new,interesting and unexpected experiences.One involved a trip to the U.S.Embassy.Before leaving home,our travel agent had advised us to let the Embassy know we were there and when we planned to depart.So,the night before we were to strike out from Belgrade I called the Embassy to tell them we were there and planned to vacation in Yugoslavia on a family camping trip for the next three weeks.Well! I was told, in no uncertain terms, that we must go to the Embassy personally and give them information about ourselves and our travel plan. So I called a taxi and off we went to the Embassy. After recording personal data – birthdays, address in the U.S., occupations, etc. 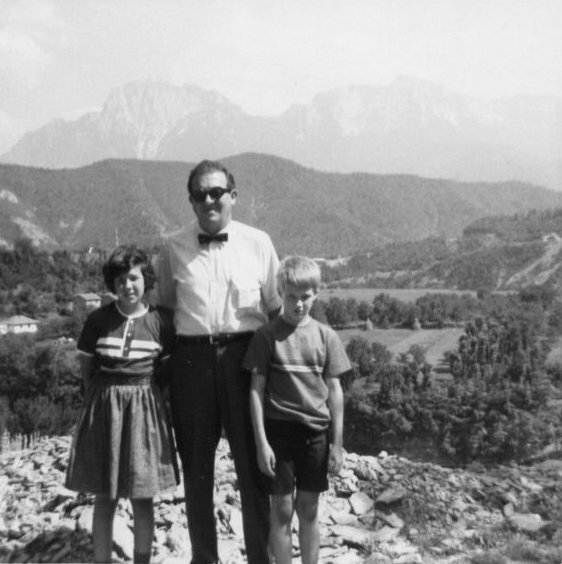 – they wanted to know where we would be every single day we were in Yugoslavia! I told them I had no idea. It would depend on where we would find places to stay, but in any event we had reservations on Pan Am on a certain date to fly to London and then New York. And then we left and went back to our Hotel. We still had one errand to do before taking to the road, and that was to buy a small gas camp stove if we could find one. I had not been able to pack one to bring with us from home. So, we set out in the center of Belgrade to find a Camping Goods store and – to our surprise- we found one rather quickly, and they had a small one burner camp stove, but the instructions were in Serbo-Croation and I wasn’t sure what kind of fuel it would use and how to get it to work . However, we had a very patient clerk and also met a friendly customer who spoke English and offered to help me, As it turned out the stove used alcohol for fuel. The next question was where could we buy the alcohol. Well, the very helpful clerk indicated he would lead me to another store where we could buy it, but it was clear he was in a hurry as he motioned for me to follow him. He signalled Barbara and the kids to stay put and wait for me and then he hurried out of the store and down the street as I ran after him. The store where one could buy alcohol for the stove was, of course, a liquor store. My friendly clerk explained what I was looking for and I purchased two small bottles, as my clerk and the liquor store proprietor carefully pointed out that I was not to drink the stuff. However, I did buy one bottle of drinkable stuff called Markovitz’s, the plum brandy Yugoslavia is famous for, but I found it much too strong for my taste. With these last purchases we felt we were finally ready to be on our way. 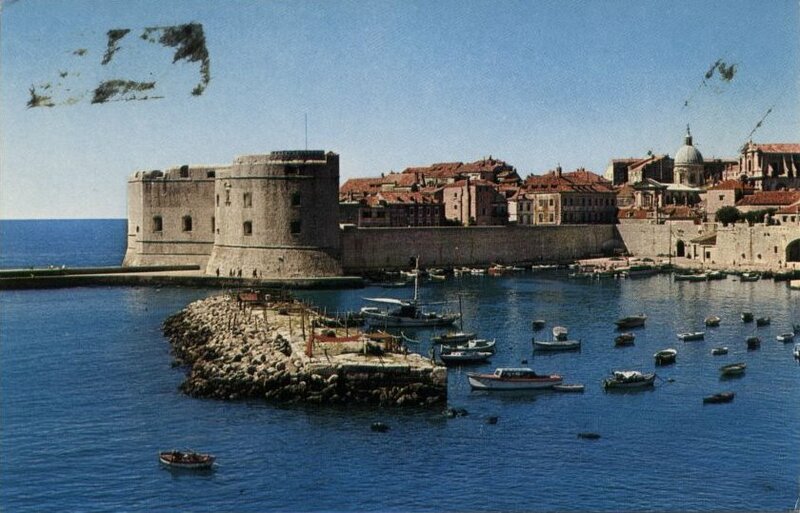 Early the morning after our adventure at the American Embassy we loaded up the Fiat and struck out toward the Dalmatian coast via Mostar to Dubrovnic. 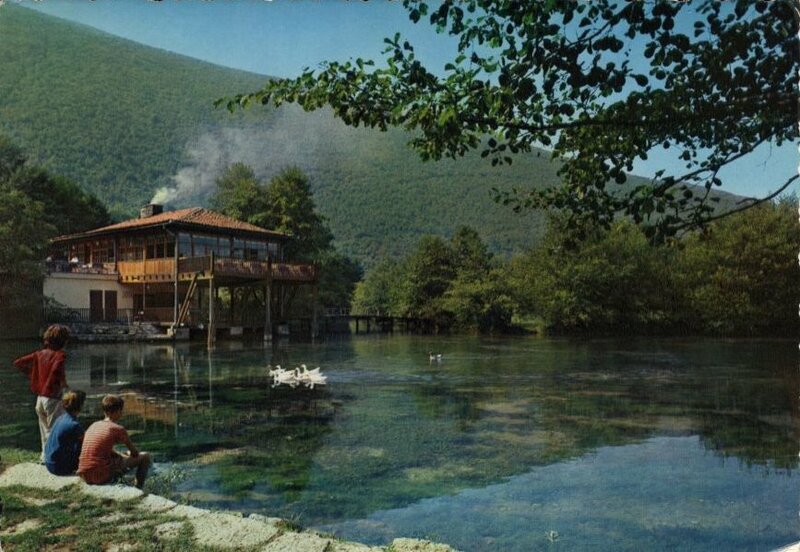 But to get to Mostar, I elected to take a shortened route over the mountains to a place called Tuzla. It turned out to be a very rough and narrow road-similar to some of the dug-ways in the Rocky Mountains in the1920s and30s-even though it was recommended to me by a man at the Majestic Hotel who had recently driven over it.On the main highway leading to the mountain road we were stopped once by a traffic policeman who asked to see our passport and my driving license and then waved us on. I supposed he had stopped us because our Fiat had a Naples license plate.It was the only time we were stopped for identification on the road on our entire trip.The mountain road was not only rocky and narrow,it was also quite scary,with the edges overlooking steep cliffs and gorges. Our son, Jon, had a couple of bad dreams after the drive on that road. We passed quite a few army trucks loaded with soldiers, and each time I had to back downhill to reach a wide enough spot in the road to pass them. Over all it was a very stressful drive, but there was one very amusing incident: a young boy – perhaps 10 or 11 years kept running uphill ahead of us to each switchback in the road where he would beg for a cigarette; I was a smoker then, but each time I turned him down – much to his obvious disgust. We finally dropped down on the other side of the mountain to a respectable highway which led us through the center of Tuzla. I stopped in front of a very nice, modern looking Hotel and decided we should have lunch there. The food was very good, but the entire town was temporarily without fresh tap water because of a broken reservoir dam. So we could not wash our dusty hands before eating. Barbara and I drank mineral water, sparing some to wipe our hands, and the kids tried the milk which they didn’t like the taste of. The road toward Mostar was a fairly good,paved two lane highway, but we could see we probably could not make our intended campsite near Mostar before dark and would be better off to find a hotel room for the night. Sarajevo was on our way so we decided to stop there for the night. However,we had lost so much time on that mountain road that it was also after dark when we reached Sarajevo. We thought we’d ask where to look for a room at the local tourist office called Putnik, so while I double parked, Barbara ran across the street to the tourist office, but it had just closed for the night! However, a young man passing by guessed what the problem was and asked Barbara if she was looking for a place to stay. She answered yes and that there were four of us. The young man said he had a place to suggest, and walked back to the car with Barbara. The place he suggested was called a “Student Hotel”, a dormitory at the University of Sarajevo, and a classmate of his was the Student Chief during the summer and he was sure he would be able to rent us a room. He told us his name was Stevo, and then got in the car and guided us to the student hotel. As it turned out there was a room for rent but it had only three single beds. However, the student chief suggested that the kids could share one by sleeping end to end. This was fine with us. We felt very lucky to have a place to crash for the night and were very tired.We were also very lucky that our two new student friends spoke such good English. We learned later from Stevo that he had studied English formally for only 3-4 months. As we carried our luggage to our room, I noted a large wash room and lavatory across the hall from us and headed there to wash my face and hands. While I was doing this a lady came in, stood beside me, nodded in my direction, said “Bonjour Monsieur”, disrobed from the waste up and began washing herself! I was quite startled, but nevertheless replied to her greeting and went right on with my own washing. Jon had followed me in and he too was a bit taken aback but simply followed my example. Barbara and Pam used the facilities later, but missed this little episode. It was by now about 9:00PM and we were starved. I asked Stevo if there was anyplace to get a meal and he responded by saying he would like to show us a place just around the corner. The place was an outdoor cafe in a delightful courtyard with colored lanterns attached to the trees overhead. Stevo explained that it was the engineering faculty club. We attracted quite a bit of attention and Stevo went out of his way to introduce us to some of the faculty and students, explaining that we were an American family who had come to Yugoslavia for a vacation. One of the elderly gentlemen was the permanent non-student chief of the student hotel. 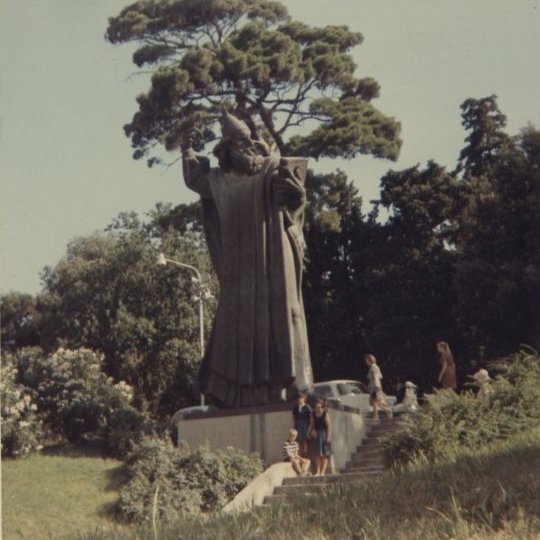 He bid us welcome to Yugoslavia and the University of Sarajevo and seemed especially interested when I told him I was a Professor at Temple University in Philadelphia. I asked him to join Stevo and us for a drink and he seemed glad to accept. In the meantime Stevo had called a waiter over and was explaining what some of the dishes were. While Stevo and the real hotel chief sipped their brandy, the four of us feasted on a combination of grilled meats and sausages called Rasjnici and Cevapcici respectively, a mixture of vegetables and crusty bread. Every thing was delicious and Barbara and I then joined the others with another Brandy. As I figured it out later that delightful repast cost me a little over $4. 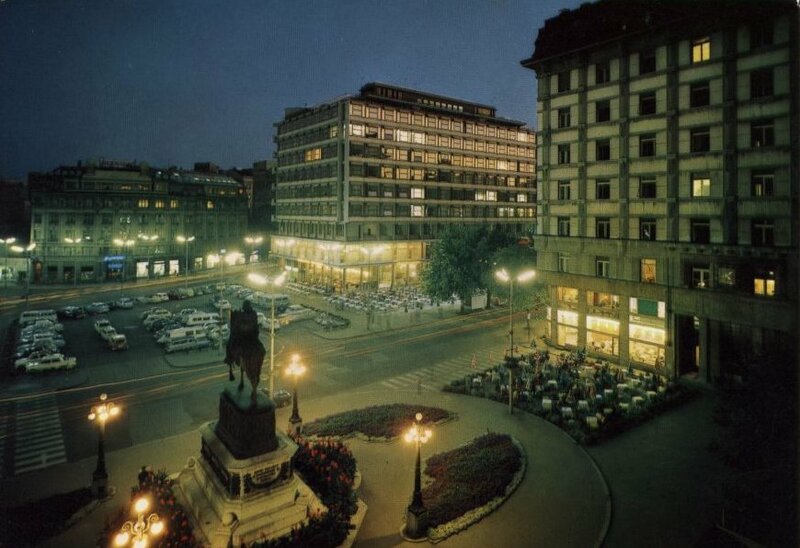 After that we were all very ready to hit the sack, but before we did Stevo made us promise to let him show us Sarajevo in the morning, and the hotel chief assured me Stevo would be a very knowledgeable guide. How could one say no to an offer like that? Stevo came to the student hotel to meet us the next morning and explained what he wanted to show us in the city.One of the major things he wanted us to see was a small museum on the bank of the river Miljacka by the Bridge Princep with a plaque above foot prints at the spot honoring the student assassin, Gavrilo Princip, who shot the Austrian Archduke, Franz Ferdinand on June28,1914to trigger World War one. Stevo also took us to the large open market, but he cautioned us ahead of time to be careful of gypsies who might try to rob us. Barbara was glad to see the market and the gypsies because they were selling string bags and Barbara wanted to take some home. Stevo watched very closely as she carried out that transaction. As we walked around the market, Stevo bought the kids some ice cream cones which made them very happy. We also visited an old Turkish house and were very impressed with the beautiful old Turkish stove inside. Finally, we stopped at a nice restaurant and I invited Stevo to join us for a delicious lunch, and during lunch Stevo told us about himself. 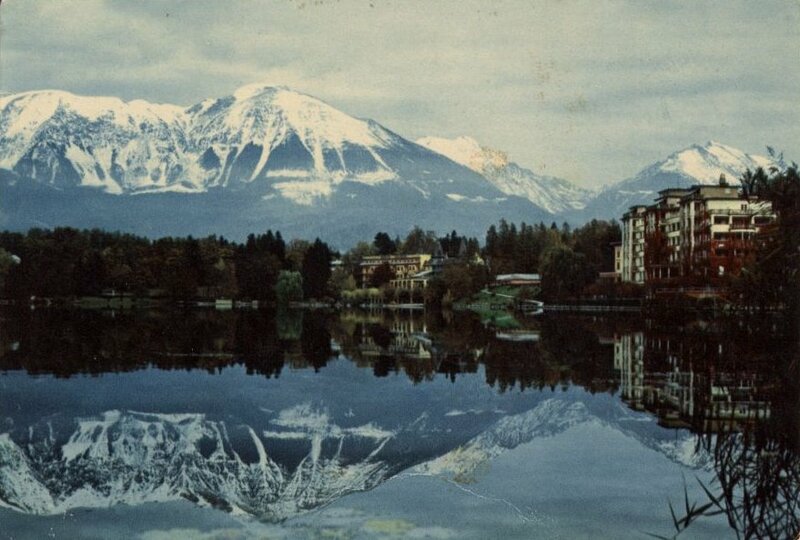 He had grown up in a small town in the Plitvici mountain region and as a small boy had seen his parents decapitated by the Nazis in reprisal for guerilla activity against the occupying Germans. 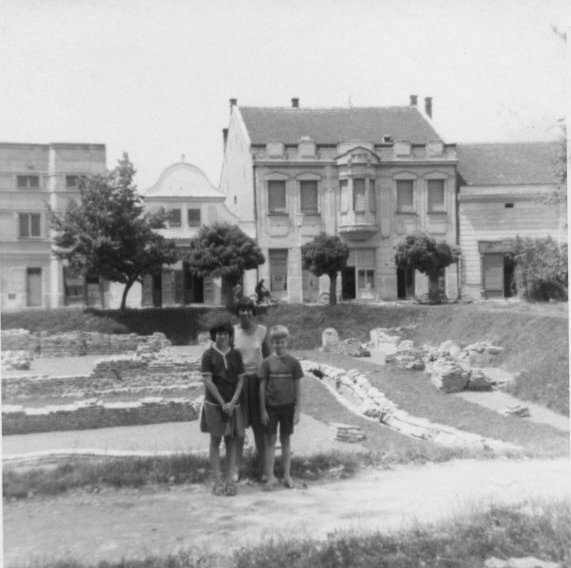 An older cousin had helped him to escape to Belgrade where he had some Jewish relatives. 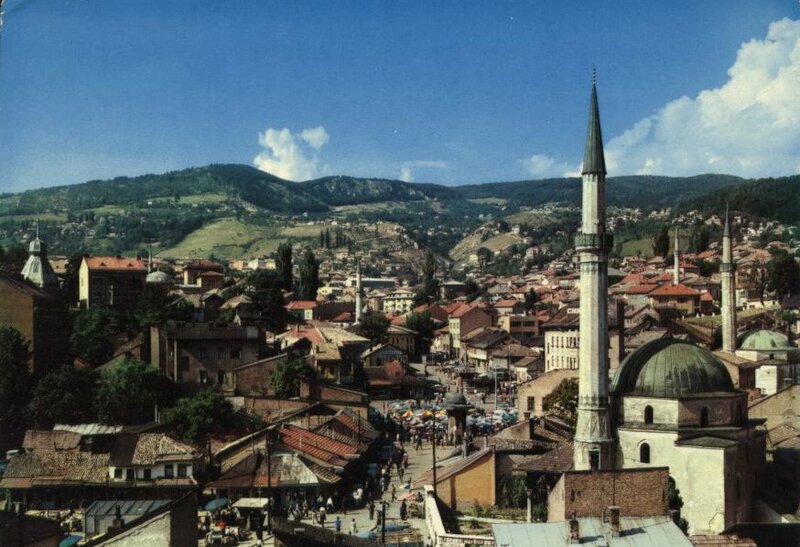 He was now a mechanical engineering student at the University of Sarajevo. 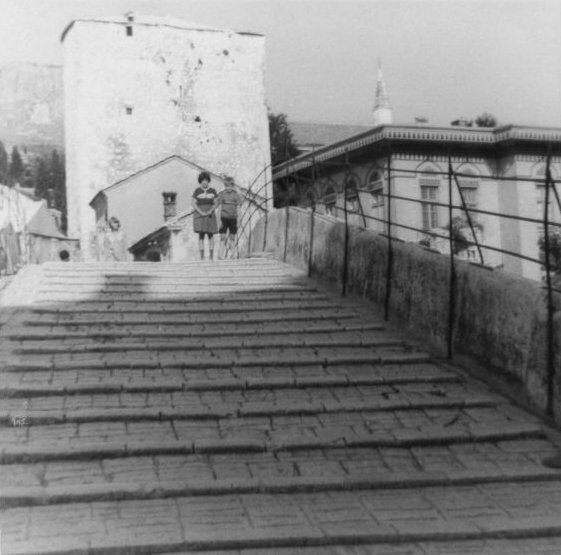 He told us that before World War II Sarajevo had been almost 50% Jewish, but now there were hardly any Jews still living there. Stevo then led us back to the student hotel on a streetcar and showed us which highway to take to reach our campground near Mostar. After we returned home I sent Stevo a letter and some textbooks on mechanical engineering, but I never heard back from him. I suspect the books never got to him, although we did receive a postcard from him thanking us for our visit and the lunch. The road from Tuzla to Mostar was quite good compared to that in the mountains, and the drive was beautiful. 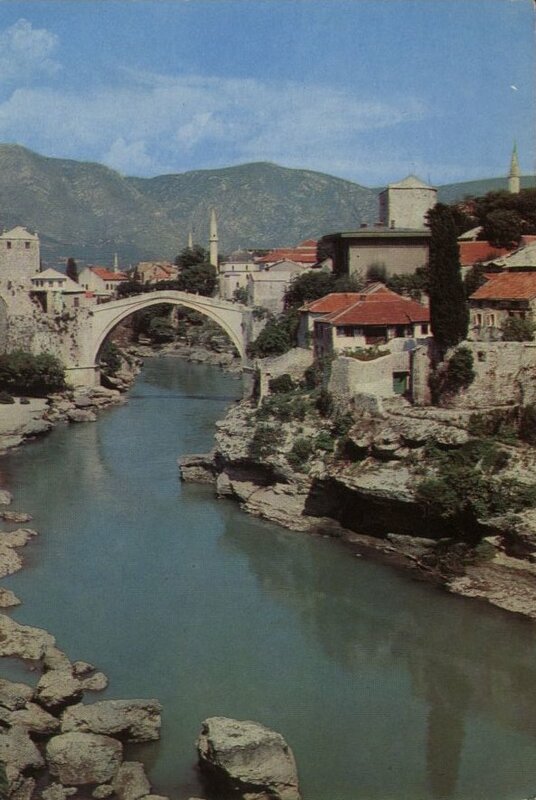 Mostar is an old city named for its famous old bridge called Stari-Most over a very rapidly flowing river. We took a snapshot of the kids on this bridge, which proved useful after our return to Jenkintown to prove to one of Pam’s doubting teachers that she had actually visited that famous bridge shown as a slide exhibit in school! Another pleasant experience in Mostar was lunch. There were a number of small Turkish restaurants along the banks of the river which displayed their cooked dishes in full view. This made it very easy for us to point to the dishes we wanted, and this delighted the kids. The dishes were also very tasty and we enjoyed them as we watched the the local kids diving into and attempting to swim upstream in the swift water. We then drove from the center of Mostar to our first campground site not far away. We were following a small car with Belgian license plates, containing several kids, and they too were heading to the camping site. There was a small river running through the campground and we pitched our tent near its bank. Our kids soon got to know those from Belgium and were soon playing “hide ‘n‘ seek” among the many trees. This campground was very informal in that no person was there to check us in or out and we simply picked our own campsite. We learned from nearby neighbors that there was a small outdoor restaurant not far away, so we decided to try eating there instead of cooking at our own site. 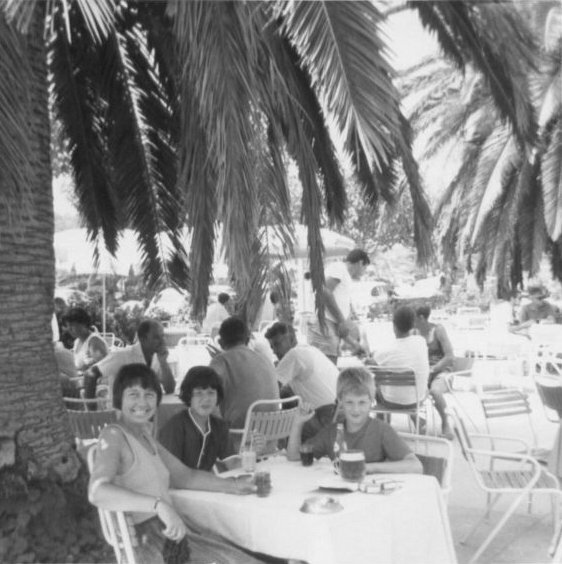 We wandered along the path through the trees until we came to the restaurant. It consisted of a spit turning over an open fire and holding what appeared to be a whole lamb or goat. Whatever it was, it was delicious! Also at this little outdoor restaurant there was a very small dance area, paved and about 10 ft. diameter and a small 3 piece band. When they started playing Chattanooga ChooChoo my wife and I decided to dance, much to the embarrassment of Jon and Pam! The toilet facilities at the campground re-introduced us to the Turkish type we had found in the Turkish Fort park in Belgrade. 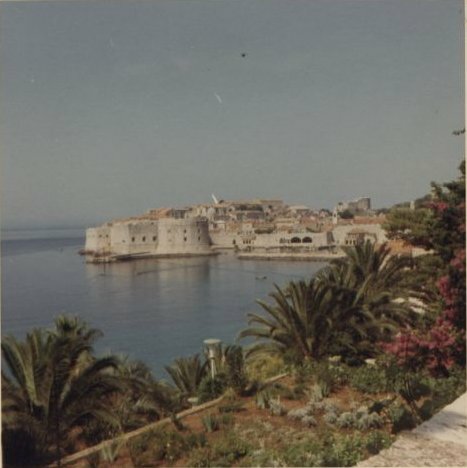 The road from Mostar to Dubrovnik was a very scenic route,and we drove directly to the campground, which was located not far outside the old walled city in a part known as Lapad. This was a rather large and closely supervised campground where we had to turn in our passport and pay a small daily fee. The sites were within easy walking distance to the beaches on the Adriatic sea, and there was a store where one could buy supplies and a bar where one could buy wine and beer. We were quite happy with these arrangements and camped there for three days. We enjoyed the swimming and enjoyed a few meals prepared on our little one-burner camping stove with its Serbo-Croatian instructions. Camping there though was quite different from what we were used to in the U.S. At home we were used to campsites separated quite a way apart.But there we were practically on top of one another. 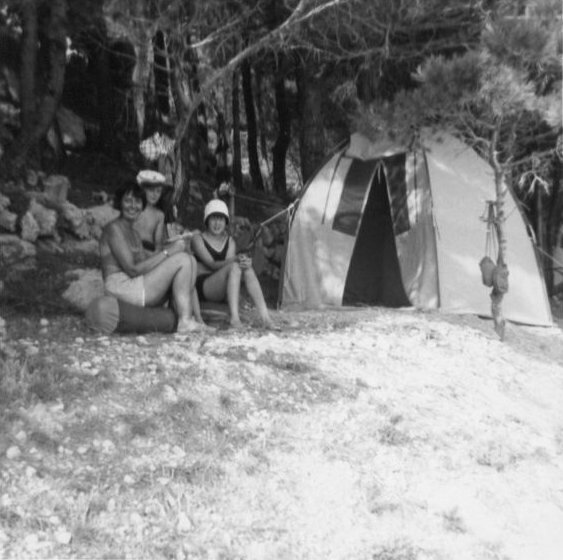 The first morning we awoke to find two young ladies camped adjacent to us, as evidenced by a pair of very feminine legs almost touching our tent.In general, the young women in Yugoslavia were very attractive, enough to generate lots of cat-calls from young men on the beaches. On our second morning there, we decided to treat ourselves to an American breakfast. From the campground we took a trolley into the center of Dubrovnik and found a restaurant serving ham and eggs! While there, where there were a few people who spoke English to answer any questions, we also planned the rest of our routes through Yugoslavia. As we drove north we stayed on the main highway along the coast where many of the places we wanted to visit were located. 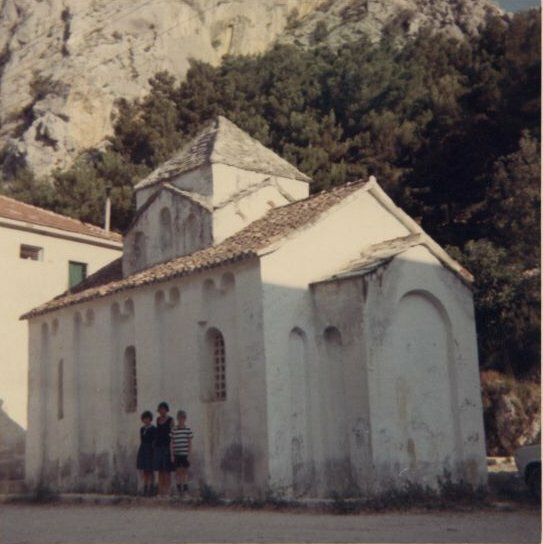 Our first stop was Omis, a small town near where the Cina river emptied into the Adriatic sea, and it was the third and most interesting of our camping sites. 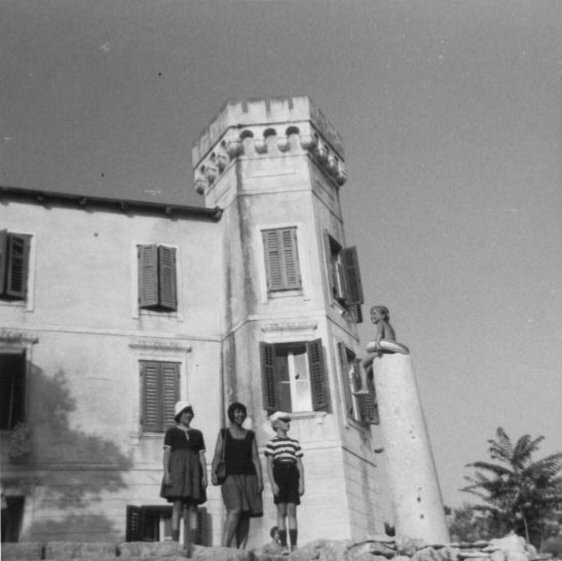 It was the most interesting for two reasons: it was located on a narrow ledge which was part of a cliff at the edge of the sea, and we were there overnight in the midst of the mistral, a dry northern wind common in southern Europe which was so strong we were afraid we might be blown into the sea! Also, the song of the cicadas was very strong at night and the kids found a very interesting old Venetian bath with frogs and tadpoles. And Pam was sure she had found some dinosaur bones until I explained they looked like goat bones. Once again we didn’t have to cook because there was a very good restaurant within walking distance along the shore – if only this were true of our many American campsites! 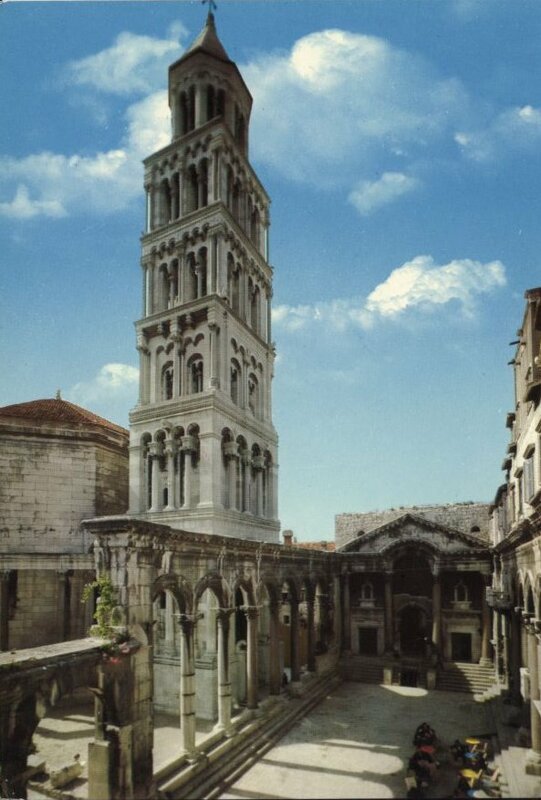 Our next stop was Split, the home of Diocletian, one of four Roman Emperors who were Yugoslavs. His palace appeared to be in very good condition, and judging by the laundry hanging from some windows, was still being lived in! We had intended to stay overnight at a campground near Split, but found that it was already filled up with other campers. So we doubled back along the cost to a very small camping site we had noticed on the way to Split. 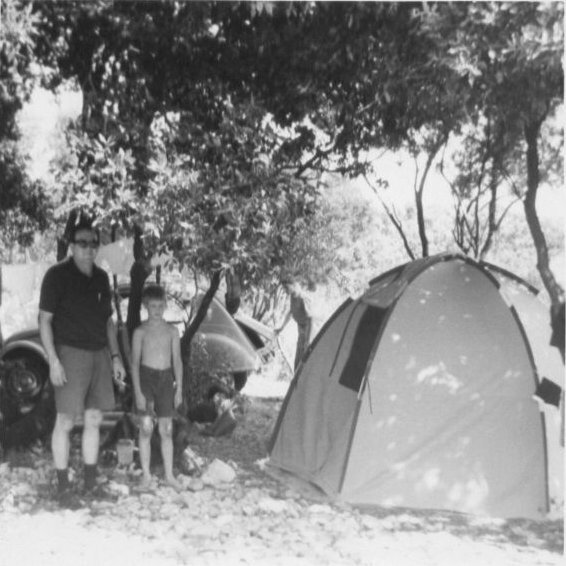 It was right on the waters edge and proved to be the final and worst of our Yugoslav campsites because of a lack of sanitary facilities. The bathroom was an open, brush covered field! Nevertheless, we stayed the night and even managed to heat a can of beef stew on our little gas stove for dinner. Our next stop was at Zadar, a pleasant city right on the coast. We found a good restaurant for lunch, during which we talked to a few other tourists and learned it was a popular vacation spot for the English. From there we continued north to Rijeka, an industrial city near the Italian city of Trieste, and from there to our next stop at Opatija, a city on the coast of the gulf of Rijeka which has a very mild climate. Because of our disappointment with our last camping site we decided to stay at a very attractive motel right on the seashore. In only a few steps the kids could dive right into the clear water – so clear you could easily see the rocks on the bottom. That evening we feasted at the excellent restaurant, and then took some welcome hot showers and retired on some welcome soft beds! Our next stop was in Postonja in the southwestern part of Slovenia, the northern-most province, bordering on Austria and Hungary. We took a guided tour of the famous Postonja Caves. 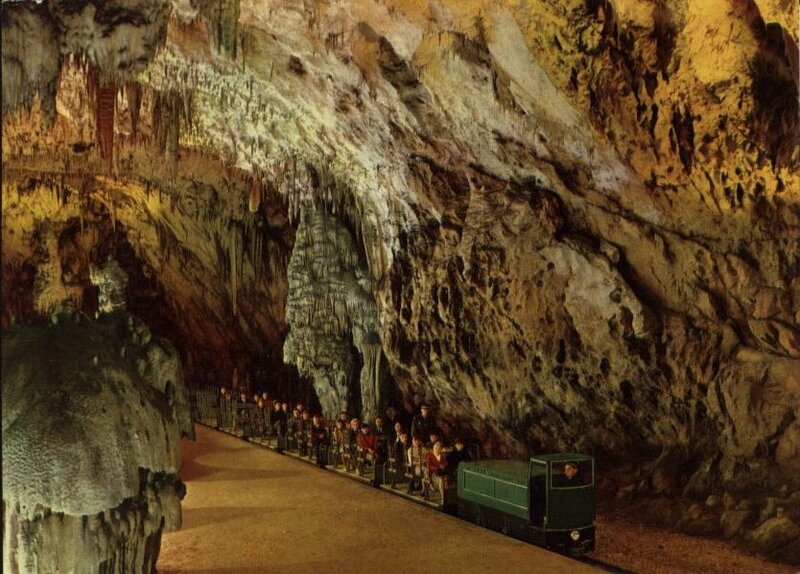 Our guide spoke English and informed us that the Postonja Caves were the world’s third largest, after the Mammoth and Carlsbad caves in the U.S.A. 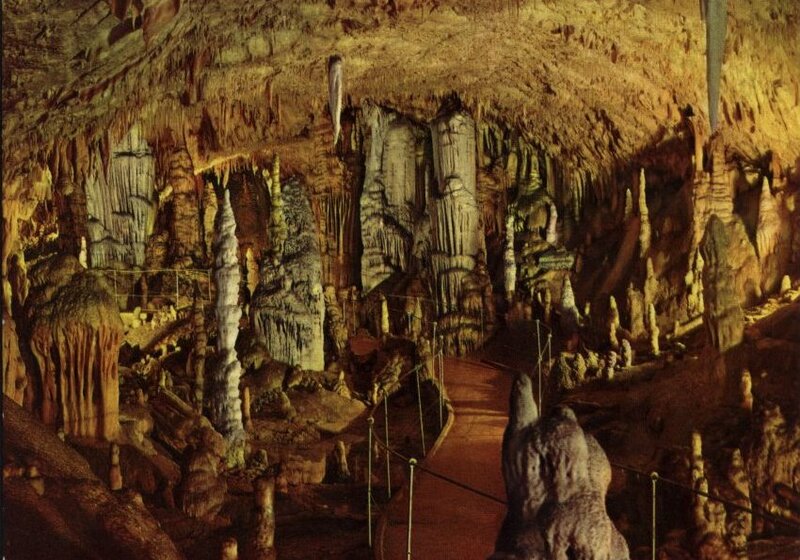 The caves were spectacular, with many stalagmites and stalactites. A river runs beneath it, and there was a pool containing a species of blind fish found only in caves in that type of rock foundation. Part of our tour consisted of a ride on a one and a half mile train built in1924 to attract tourists. 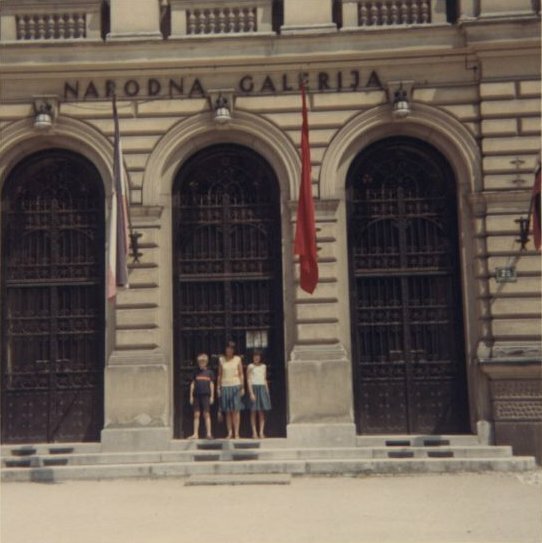 From Postonja we drove to Lubljana, the capital of Slovenia, and took some family photos in front of the Narodna Art Museum. 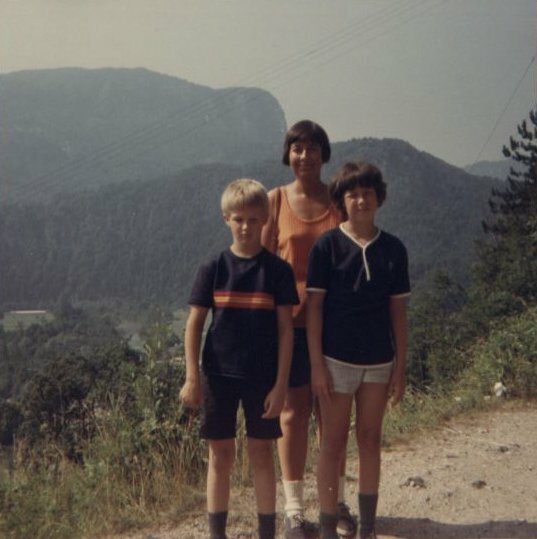 Then we headed north again to Lake Bled, also in Slovenia in the Julian Alps. The campground there was very crowded, so we quickly decided to look for a hotel. The first one we stopped at was full. We guessed that we might more easily find rooms at one of the more expensive hotels and our guess proved to be correct! We stayed at the very fanciest hotel in Bled – in a two room suite in the Toplice Hotel right on the bank of the beautiful alpine lake. Our rooms were quite inexpensive in terms of dollars (about $20). The view of the lake and the mountains from our 2nd floor balcony was spectacular. On a high rock above the lake on our right was an old castle and an island in the middle of the lake on which was located the pilgrimage Church of the Blessed Virgin with a wishing well. We paid a local guide to row us out to the island and made our wishes. To the left of the hotel was a unique swimming pool in the lake! It was a large rectangular wooden frame about 30 by 20 ft. submerged about 6 ft. into the lake, with side guards and spaced boards on the bottom to prevent one from falling through into the very deep water. We were surprised to find that swimming with you in the frame were large lake trout which could enter and leave as they wished. Another surprise awaited us at dinner the first night we were there. It was served on a balcony over hanging the lake and, of course, the main entre was trout. Then suddenly, in the middle of dinner, we were treated to a wonderful fireworks display which was originating from the castle above the lake in celebration of a Slovenian holiday much like our Independence day – and it was purely by chance that we happened to have arrived on that day. As a final surprise that evening, the waiter insisted we have their special dessert, which consisted of a large mound of alpine strawberries covered with powdered sugar. 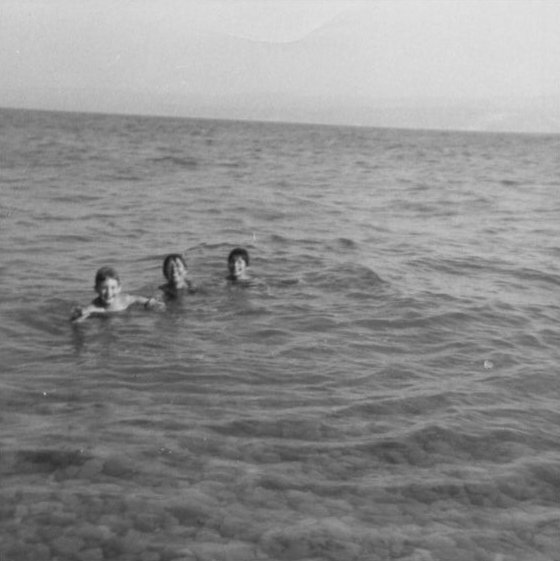 The next day we walked around the lake to the site of Marshal Tito’s summer villa and took some snapshots of the kids. We were going to take the photo in front and up close to the villa, but a “no photo” sign in front made us too fearful to do so. We remembered we were in a communist county behind the iron curtain! 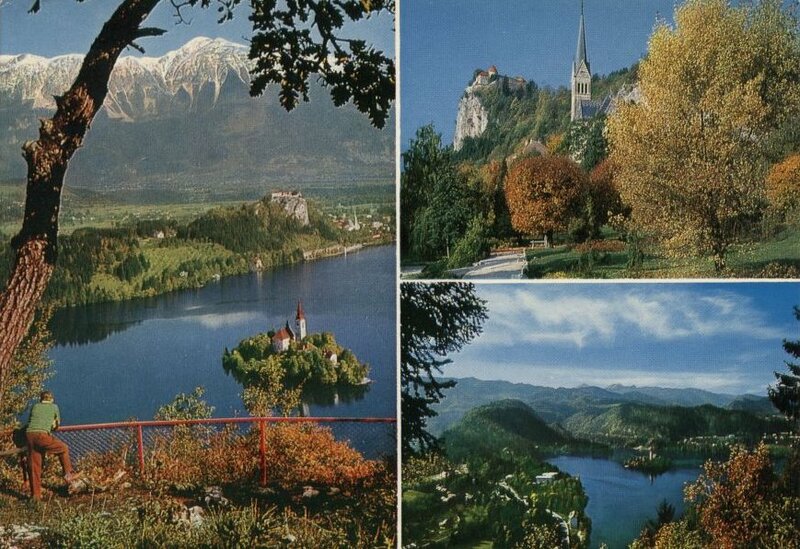 After our stay at Lake Bled we decided to turn back toward Belgrade for our return flight home, since we were not sure of the travel time and did not want to miss our return Pan Am flight. We made three stops on the way back along the main highway between Lujbljana and Belgrade. 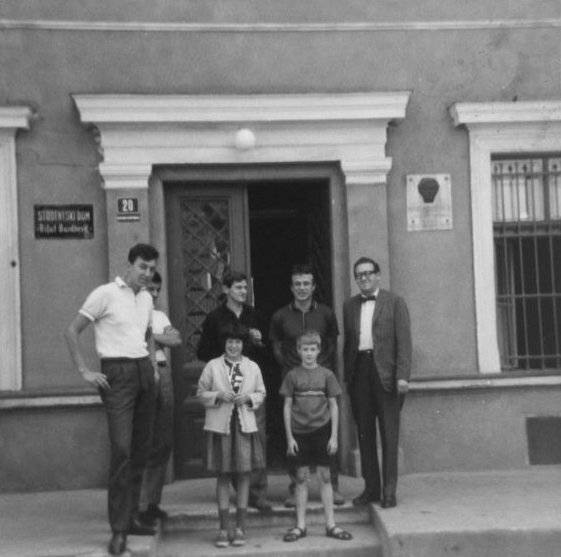 The first was an overnight stop at a motel near Zagreb. In the restaurant there we met and exchanged experiences with two other foreign travellers. One was a farmer from Scotland who had been stranded there because of car trouble with his Bentley. The Yugoslavs did not have any Bentley parts to fix it! 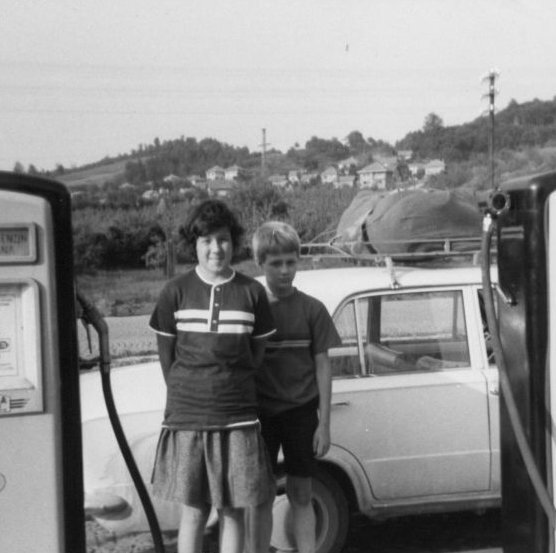 He asked what we had found suitable for driving in Yugoslavia and I pointed to our rented Fiat 124, which had given us absolutely no problem. When we left he was still waiting for parts for his trusty Bentley to be flown in from Scotland. The second traveller we met there was an English couple driving back to England by way of Bulgaria and Yugoslavia. 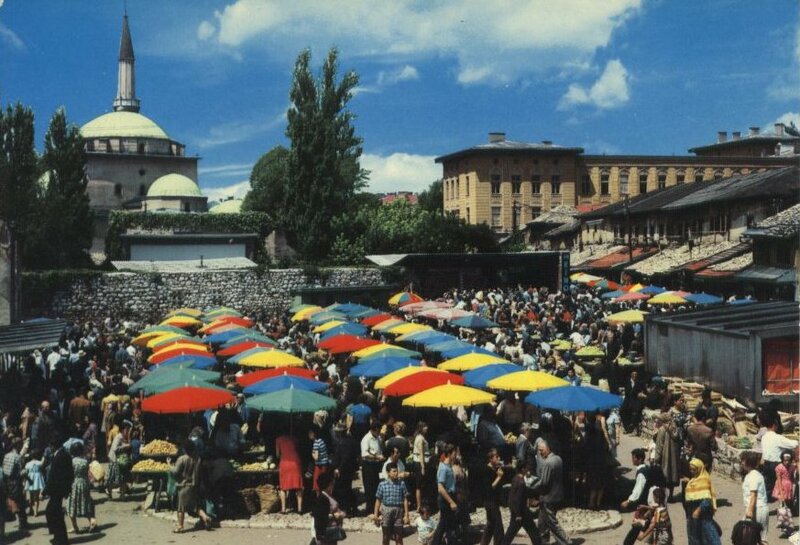 They agreed with us that Yugoslavia was a wonderful country to visit – but not as interesting as Turkey in their opinion. For our next stop we left the main Zagreb-Belgrade motorway and drove a short way to Banja Luka, the second largest city in Bosnia. 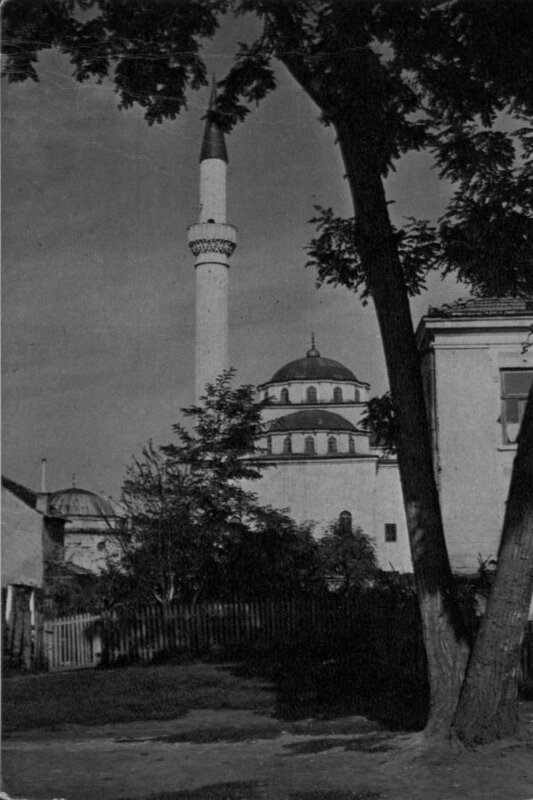 Bosnia was a province which was mainly Muslim, and Banja Luka had an important mosque. 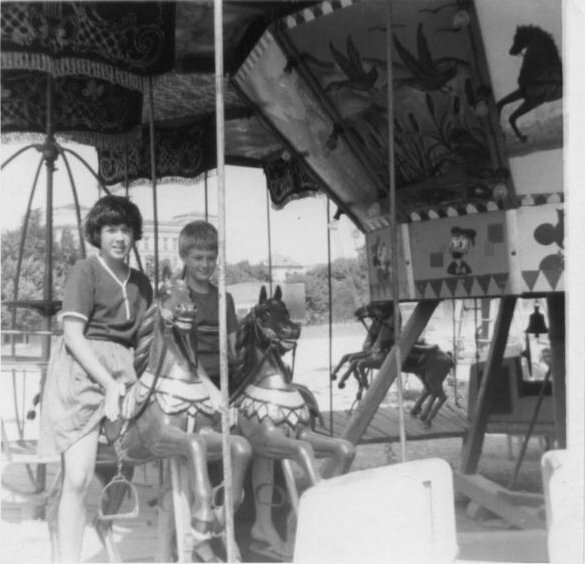 The city was also noted for its Roman ruins, and had an amusement park in which the kids had fun riding the merry-go-round. Our last stop before reaching Belgrade was at a small, uncomfortable motel in the town of Medujoric. There were two teenage girls at the entrance to the motel looking for car washing business, so I had our dusty Fiat cleaned up. 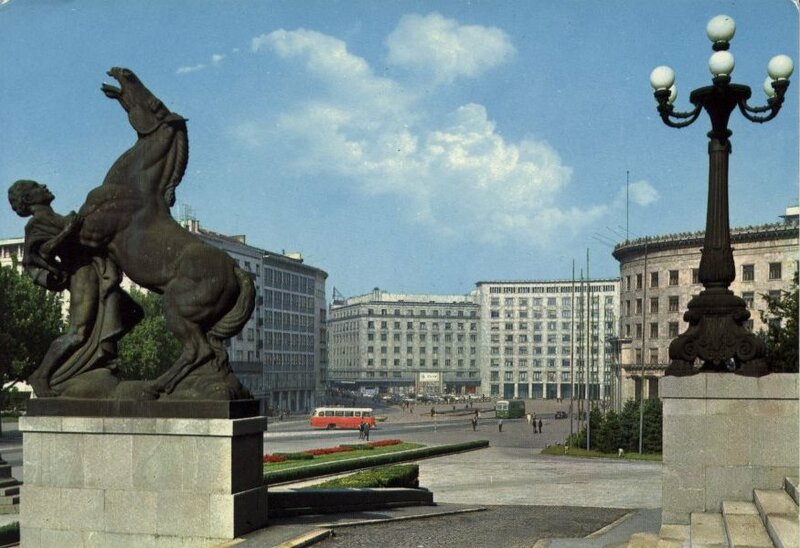 When we arrived in Belgrade we drove straight to the Majestic Hotel, where we had reservations for our last two nights in Yugoslavia, and where I was also able to turn our car back to Kompas, the tourist bureau from which we had rented it. The first night back at the Majestic Barbara was not feeling well, so she stayed in the hotel to rest while I took Pam and Jon out for a walk and ice cream (sladoled) cones. It was after dark and we were attracted to an area outlined by hanging Japanese lanterns. A young girl explained that it was in preparation for an outdoor theater which was very popular there. After walking around several streets, Pam announced that she felt safer walking in Belgrade at night than she did in Philadelphia! On this second visit to Belgrade we were also more comfortable with the Serbo-Croatian language, since we had learned quite a few words and common phrases on our travels through the country. 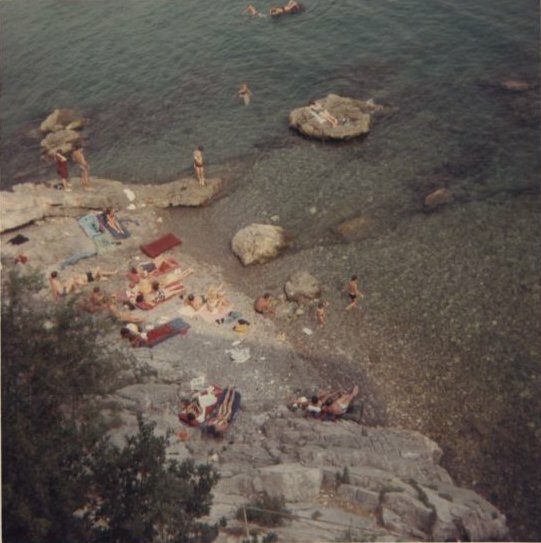 We left for home after a final day in Belgrade, each hoping we might one day repeat our wonderful vacation in Yugoslavia.